I know more about LEED than I know about specs, so don't think I'm some expert on this subject (or LEED for that matter). As you'll see in a second, there's a few differing schools of thought about how to arrange LEED requirements in the specs. I strongly encourage you to share what's worked or your concerns by leaving a comment! To me the main issue is how much control does the architect/designer retain and how much is given to the contractor. Do you write erosion sedimentation control, indoor air quality, and construction waste management plans and simply require the contractor to follow what's included, or do you require that they draft, implement, and verify implementation for each plan themselves? Do you specify recycled content levels for each individual material, or do you simply set a 20% recycled content level for the whole project and let the contractor figure it out themselves? Do you give the contractor direct access to LEED-Online, or do you have them send the architect the necessary supporting documentation and let the architect ensure everything is filled out properly? In a perfect world, we would all be in design-build projects where the team of architect and contractor work together to solve these issues. Unfortunately we still live in a time where design-bid-build construction contracts get in the way of truly integrated project delivery, and without clear boundaries you're setting yourself up for some serious liability problems. When it comes to MRc3-7 and EQc4.1-4.4 I like to set individual LEED product requirements in the material sections (MF04 divisions 02-10) instead of setting a blanket credit achievement goal for the total project (MFO4 section 018113) and letting the contractor figure it out on their own. I feel that the architect should be responsible for determining and considering how to earn these points at least as much the contractor. If I design a wood framed structure with little chance for recycled content, how can I require a contractor to achieve 20% recycled content by cost? Also, I've heard from a few people that subcontractors sometimes don't read the division one sections, and having clear performance requirements in the later divisions helps to ensure important elements aren't overlooked. Assuming a premium for sustainable purchasing, by placing reasonable requirements for each material there's no incentive for the contractor to only reach the minimum content levels required to earn the point. In one project where we set individual requirements, we're earning exemplary performance for regional materials, with a total project rate over 40%. I'm not sure contractors would necessarily maximize sustainable purchasing if they're only required to meet a lower level. Conversely, by setting performance requirements for more materials than is required to earn the point, the architect/specifier may be unnecessarily raising the total cost of the project. There are a number of people who disagree with me about setting levels for each material. One person with significantly more specification experience than myself claimed that such a strategy "smacks too much of means and methods". I can't say I completely disagree, especially when considering regional materials requirements. The argument is that we're effectively telling the contractor what to buy and where, limiting their ability to construct efficiently. There is also a significant amount of due diligence required by the architect/specifier to ensure that at least three companies can meet whatever requirements are set for public bid projects. If you're not getting paid for that it can be a serious impediment for profitability. Talking to a contractor with significant LEED experience, I've learned that they tend to see both. Recycled content and VOC levels may be listed in individual sections, but a blanket regional materials requirement will be set allowing them to pick and choose the most efficient methods for purchasing. This seems to me to be a very reasonable approach. It's very important to clearly state what the contractor is required to do regarding additional paperwork and LEED-Online documentation. If you don't you could get half-way through construction expecting things to be loaded online with the contractor refusing to do so because that scope of work wasn't included in the bid. Typically all of this information will be described in 018113-Sustainable Design Requirements. I prefer to require the contractor to complete the credit templates themselves and load any required supporting documentation on their own. If the architect/LEED consultant asks for the supporting documentation only to fill out the credit templates and LEED-Online information themselves, they're essentially verifying the contractors work... in writing! This seems to be a ridiculous way to submit yourself to unnecessary risk. At the same time, I like to see progress reports on where we stand with the points as construction proceeds, so we frequently will require updates on a regular basis. Regarding the various management plans required for the contractor to follow, Len Harding, CDT suggests in an article in the Construction Specifier that it's best to dictate as much of the potentially ambiguous requirements as possible to the contractor to prevent them from just throwing unnecessary money into the bid. In general, a construction waste management plan from one project could easily be adapted to another. This shouldn't be an issue for contractors with LEED experience, but you have people who may be bidding on their first LEED project you will want to provide as much information as possible upfront. 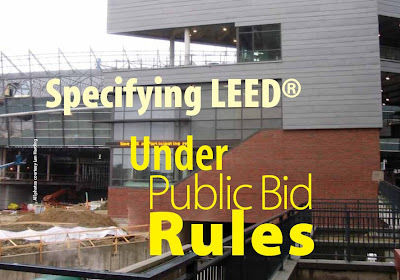 The article I just mentioned from Len Harding is titled "Specifying LEED Under Public Bid Rules" and contains some practical advice for cost control and general structure that I found very helpful. If you subscribe to ARCOM's MasterSpec they have a page describing the location and comments for all of the LEED related language online. Their language included is quite in-depth, though they provide specs that include all LEED rating system options instead of separate guide specs for LEED-NC, LEED-CS, LEED-CI, etc. I got a bit confused working from the section 018113 word document without having the commentary on screen as well. Do you happen to know of a resource that will allow a design team or specification writer to quickly find materials as it relates to the Regional Materials credit? Not really, the best I know of is 4specs.com has a "search by zip code" feature. It's not perfect for a number of reasons, but it's a good start. regarding "quickly find materials"... to meet the regional material credit? the best method I know of is sort of backwards -- you design the building, then you start looking for what's local. The MR credits are based on an aggregate of cost (material, not labor) and you're going to get your best value using the big-content items -- steel, concrete, wallboard, and the like. If you want one room with Venetian tile, its not going to impact that credit as long as the tile doens't cost more than everything else in the project. So... concentrate on the bulk items first. I've found that this credit isn't that hard to get except in some parts of the country -- like Hawai'i -- its impossible to get. How conscientious has everyone been about following the 2.2 guideline that have been "extracted, harvested, or recovered" as well as manufactured within the 500 miles. We are out in Idaho, and have found that although we can find a lot of material that is manufactured nearby, most of that material (especially the recycled scrap) is all the way from all over the country. Even for our glu-lam beams that were manufactured only 50 miles away, the FSC wood was gathered from a number of sources. Were earlier versions of LEED easier on this point, or has this always been impossible to get for those of us in the boonies? I'm working for a company that supplies sports equipment to schools and have found the same problem to be true. We have many different sources for things like steel and aluminum, not only that, but they have been extracted in one state, processed in another, and manufactured in another before they even get to us. This is the way the industry is set up, and makes it very difficult to offer our customers any credit for the regional materials credit. I think the Regional MR5 credit requiring "extraction" included is going to prove the biggest proverbial egg in the USGBC's face as time goes on. I'm working on a public bid job and "extraction" is just not documentable for the majority of materials & products. The best you can try for are the big $ tickets: concrete, masonry etc.